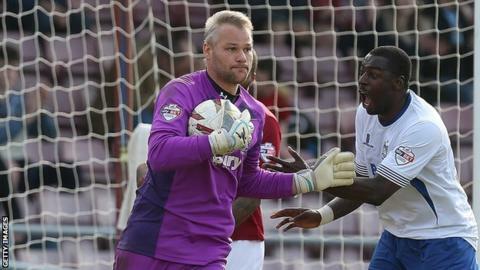 Goalkeeper Brian Jensen would like to extend his stay at League Two side Bury beyond the end of the season. The 38-year-old initially joined the Shakers on a short-term contract in September and later extended that deal until the end of the campaign. "Obviously I want to stay and be a part of this football club and get promotion this year or next year," the ex-Burnley keeper told BBC Radio Manchester. "It's a transition and I want to be a part of it. It's up to the manager." Jensen, who played for West Bromwich Albion and spent 10 years with Burnley before joining Bury, has made 34 appearances for the League Two club this term. David Flitcroft's side have battled to stay clear of the relegation zone for much of the season, but three consecutive wins have taken them up to 11th in the table and in with an outside chance of reaching the play-offs.